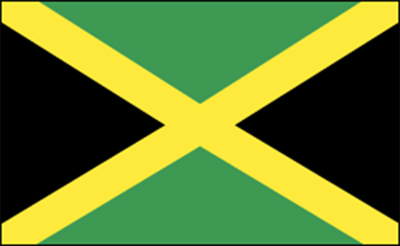 Language: The official language of Jamaica is English. However, Jamaicans also speak an English-African creole known as Jamaican Patois. 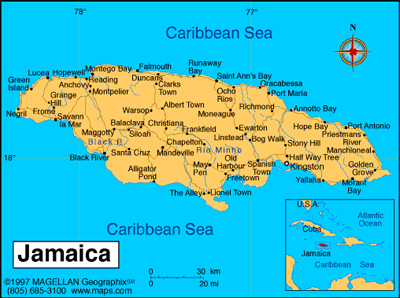 Geography: Jamaica is an island in the West Indies, 90 mi (145 km) south of Cuba and 100 mi (161 km) west of Haiti. It is a little smaller than Connecticut. The island is made up of coastal lowlands, a limestone plateau, and the Blue Mountains, a group of volcanic hills, in the east. History: Jamaica was inhabited by Arawak Indians when Columbus explored it in 1494 and named it St. Iago. It remained under Spanish rule until 1655, when it became a British possession. Buccaneers operated from Port Royal, also the capital, until it fell into the sea in an earthquake in 1692. Disease decimated the Arawaks, so black slaves were imported to work on the sugar plantations. During the 17th and 18th centuries the British were consistently harassed by the Maroons, armed bands of freed slaves roaming the countryside. Abolition of the slave trade (1807), emancipation of the slaves (1833), and a drop in sugar prices eventually led to a depression that resulted in an uprising in 1865. The following year Jamaica became a Crown colony, and conditions improved considerably. Introduction of bananas reduced dependence on sugar.